Water engineer Ian Toohey's work environment is about to change. Ian and his wife Amanda are flying to Lima, Peru to work with the Peace Corps. Ian said goodbye to his coworkers in Garver's Norman, Oklahoma office last Friday. 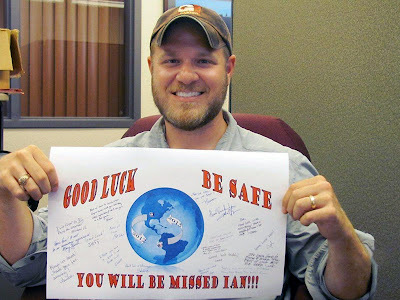 He provided the Garver blog with some thoughts about his next adventure, and all of us at Garver wish him well. We're proud of you, Ian! We'll be serving in Peru for the next 27 months. I will be serving as a water and sanitation engineer, working on community-scale projects ranging from water supply development to proper waste disposal and including some environmental and point-of-use treatment projects. My wife will be a community health promoter, working on health curriculum in schools and homes to encourage proper sanitation, prenatal health, and reproductive health. Our decision was largely motivated by our belief in the importance of international service. It is the mission of Peace Corps Volunteers to facilitate a cultural exchange between our communities here in the U.S. and those abroad. My wife Amanda and I hope to be positive representatives of American culture and values to the Peruvian people, and to bring home our experiences to share with our neighbors here in the U.S. Also, we see this as an exciting adventure, a chance to broaden our horizons and have a memorable experience that will have an impact on the rest of our lives. My experience at Garver has greatly expanded my knowledge base and confidence in design and project execution, both on paper and in construction. I've had the opportunity to work on a wide range of projects while with Garver and have also gained experience in project administration and construction management, all of which will translate into the type of work I'll be doing in Peru. The circumstances and constraints will be different, but the engineering approach I've developed as a Garver employee will still be applicable. I have greatly appreciated the experience I've had at Garver, and the support I've received during the long process of becoming a Peace Corps volunteer. I acknowledge the investment that Garver made in me as an employee, and I hope to honor that investment by serving in a way that brings credit to Garver, my profession as an engineer, and my country.